Herewith: the inauguration of Still Dots, a project entailing 102 blog posts written by the Walker’s Film & Video staff over the next 51 weeks. Inspired by Nicholas Rombes’ “Blue Velvet Project” at the Filmmaker Magazine blog, Still Dots will analyze a series of cinematic still images. 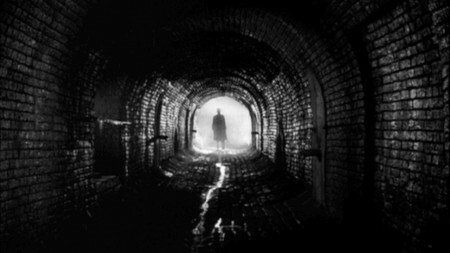 Each Tuesday, Jeremy Meckler will post his analysis of a single frame from The Third Man, beginning with the very first still image from the film. Each Thursday, Matt Levine will post his analysis of one frame 62 seconds later. One of the most evocative and multilayered postwar British films, The Third Man (one of the holdings in the Walker Art Center’s Ruben/Bentson Film & Video Collection) is readily available on stunning Criterion Blu-Ray or DVD, and is also available to stream instantly on Netflix; we hope the first installment of this project is a valid enough reason to (re)visit this infinitely entertaining masterpiece.